One-fourth of teens have misused or abused a prescription drug at least once in their lifetime, a 33 percent increase over the last five years, a new study finds. One in eight teens say they have taken Ritalin or Adderall when it was not prescribed for them, according to the study by The Partnership at Drugfree.org and the MetLife Foundation. The Partnership Attitude Tracking Study (PATS) found parents and caregivers have lax attitudes and beliefs about teen medicine abuse. 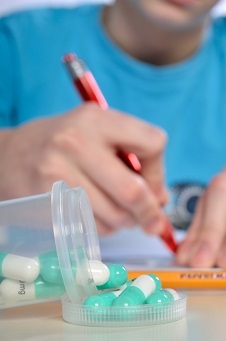 Almost one-third of parents say they believe prescription stimulants such as Ritalin or Adderall, used to treat attention deficit hyperactivity disorder (ADHD), can improve a teen’s academic performance, even if the young person does not have ADHD. Of teens who said they abused prescription medications, 20 percent did so before age 14. One-third of teens say they believe “it’s okay to use prescription drugs that were not prescribed to them to deal with an injury, illness or physical pain.” The study found 27 percent incorrectly believe that misusing and abusing prescription drugs is safer than using street drugs. Teen abuse of prescription painkillers such as OxyContin and Vicodin has remained stable since 2011. The study found 16 percent of teens reported abusing or misusing any prescription pain relievers at least once in their lifetime, and 10 percent said they did so in the past year. Parents are much more likely to talk to teens about marijuana or alcohol than prescription drugs. Teens reported that during the last conversation they had with their parents about substance abuse, only 16 percent said they discussed the misuse or abuse of prescription painkillers, and 14 percent discussed any type of prescription drug. In contrast, 81 percent said they have discussed marijuana and 80 percent have discussed alcohol.